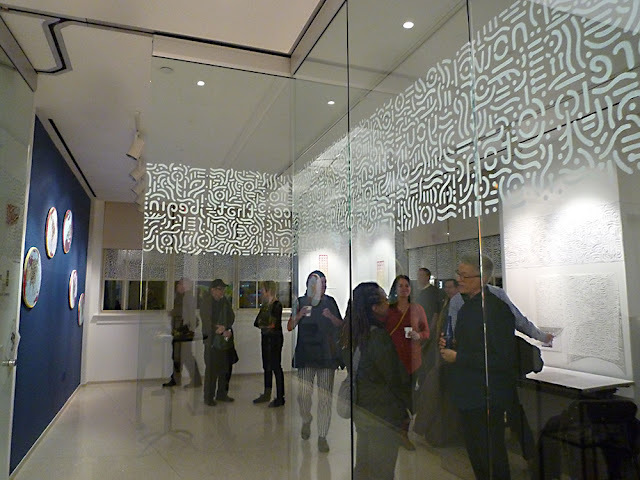 DOEprojekts (Deborah Adams Doering & Glenn N. Doering) opened their newest installation titled Migrations, on Thursday, February 23, 2017, at the Sheen Center Gallery, 18 Bleecker Street, NYC. The exhibition continues through Sunday April 9, 2017. 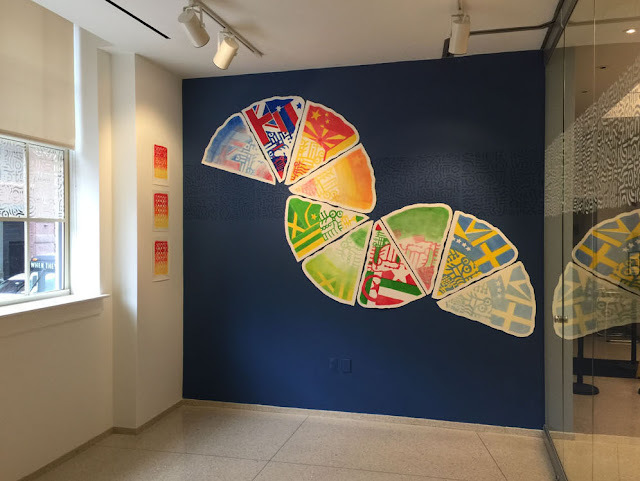 The installation explores, interprets, and interrogates the timely cultural keyword "migrations" through the use of the Doerings' visual Coreforms (more about Coreforms may be found here.) 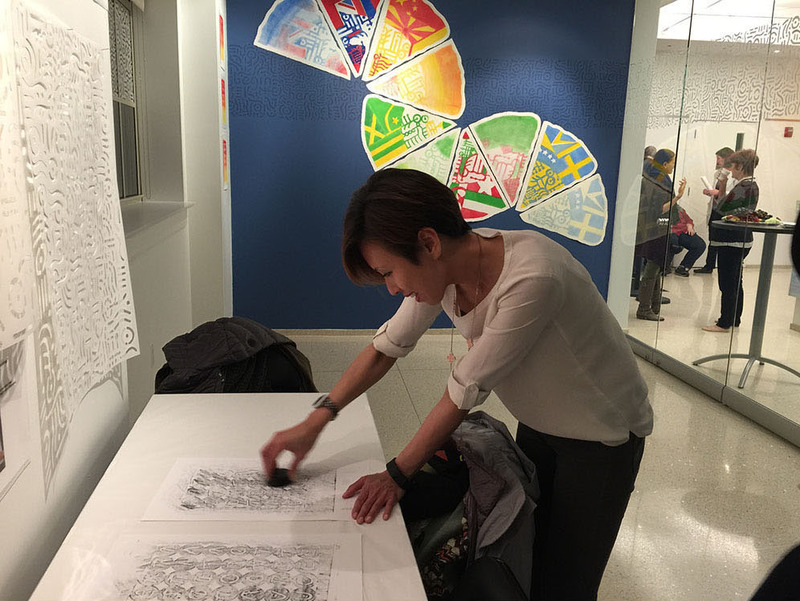 The installation offers visitors opportunities to create their own coreform-related "Migration Rubbings" from unique hand cut stencils hanging on the gallery walls. The Migrations exhibition features several recent print works, including the 130" x 60" Global Waving series. Essayist Allison C. Meier writes "... DOEprojekts' Global Waving warps flag iconography into migratory forms. Using the coreforms as these primal symbols, and turning each flag into an elongated triangle, DOEprojekts involves its audience in building new identities from the fragments. Recognizable icons of national identity are suddenly displaced, rearranged, and reconsidered. Instead of geopolitical meaning, the flags become unstuck from their time and place." In another part of the installation, the "Migrations Maps" are designed by DOEprojekts and stitched by members of the Rwandan women's art/craft collectives called Savane Kabuye and Savane Kigali. These collectives include women from both sides of the bloody 1994 Genocide against the Tutsis. 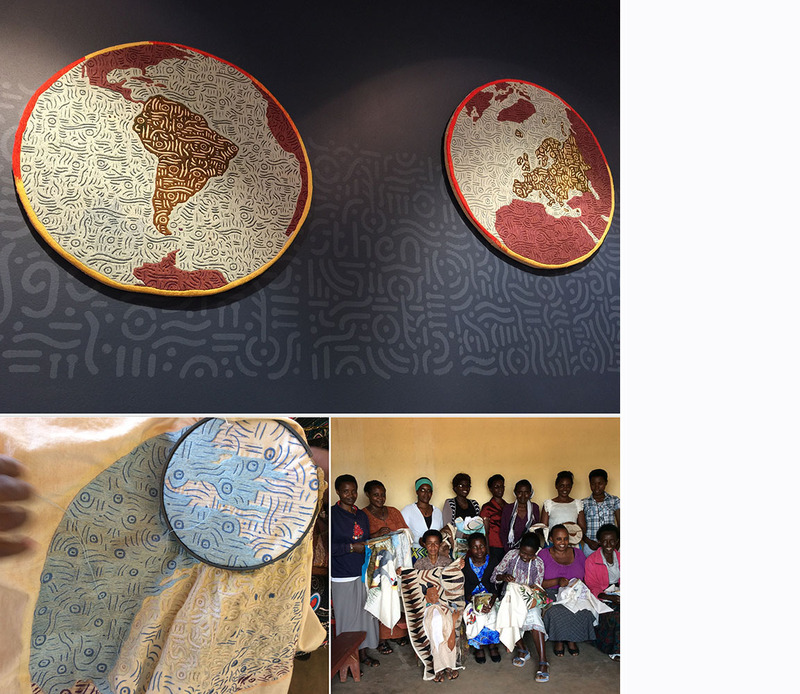 Educator Juliana Meehan's Pax Rwanda exhibition inspired and connected DOEprojekts to the women's collectives in early 2016. The five "Migrations Maps" were begun in April 2016 and finished just before the beginning of 2017. We are grateful to Pax Rwanda/Juliana Meehan and also the extraordinary women of Savane Kabuye & Kigali, who express in real life, one of the most basic conceptual ideas linked to the Coreforms -- that "opposites" (or those who find themselves on opposite sides of a division) are, in fact, not opposite at all, they can be seen as united, when one changes one's perspective. 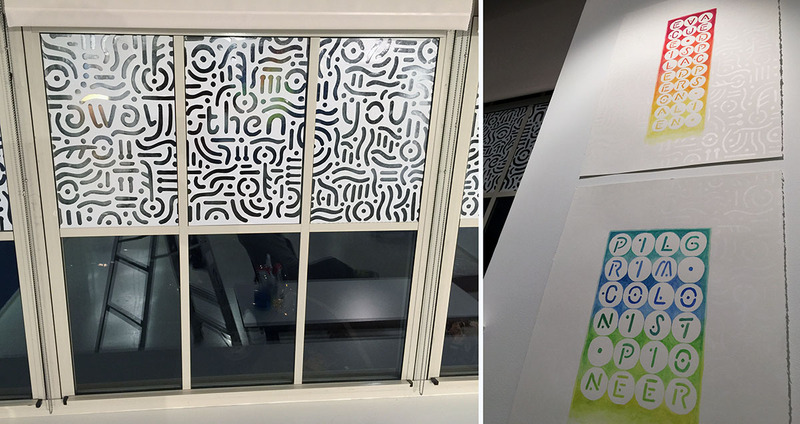 The movement/migration of the Coreforms are seen in several other works in the Migrations installation, including the "Migrations Stencils" and "Hot Button" prints. As Meier writes "The 'Hot Buttons' hand-cut stencil and print works visualize the various ways a person can be defined when passing between oscillating borders; expatriate; immigrant; refugee; evacuee; displaced person; alien. Another reads: pilgrim; colonist; pioneer. And yet another reads: artist; agitator; activist. While all these words are familiar, and likely evoke some image in the imagination, seeing them linked together asks for a reevaluation of which we consider synonyms, and which secluded states of being. And turning the words into objects reduces some of that labeling power." DOEprojekts is very pleased to reduce "labeling power" in our current cultural era. If you have any questions about our exhibition or would like to reserve your space at one of our participatory events, please contact us at DOEprojekts@gmail.com.